All contents stored on the PortaStream™ are controlled via the specialized cloud server; PortaCloud. Data update can complete just upon synchronizing the PortaStream™ with TEAC PortaStudio. Three data update options, 4G (LTE), Ethernet or USB flash drive, are given to use depending on the situation. During syncing, other useful data stored within PortaStream™, such as status of data usage, can also be retrieved. PortaCloud is managed by the PSV Editor. The PSV Editor is a content management application that allows a user to customize interface and content. 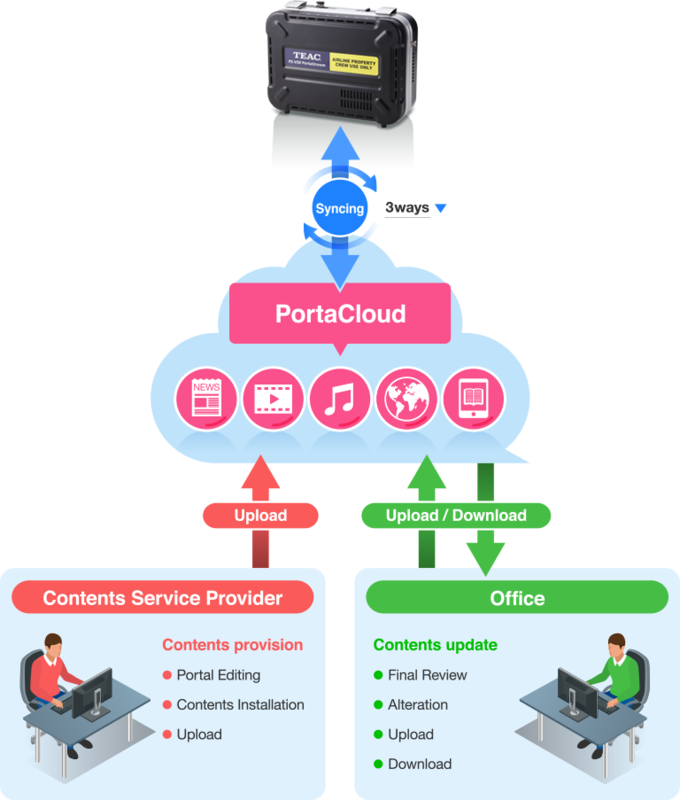 There are 3 ways to synchronize the PortaStream™ with PortaCloud. The PortaStream™ automatically downloads scheduled contents while the aircraft is on the ground. Sending a command from the ground management system, the PortaStream™ starts syncing. The PortaStream™ automatically detects the latest contents from a connected USB flash drive. Syncing PortaStream™ begins with operation on the unit. Copyright © 2019 TEAC Corporation All Rights Reserved.